Valerie Papaya Mann is a native Washingtonian. "We are in a true state of emergency .. Finally, we're waking up. Already, the infection rates are huge. We can try to respond the best way we can." Just a few years after coming out in the mid-1970s, she plunged headfirst into the African-American gay and lesbian community, involving herself in theatre, performance art, and politics. In 1978 she was one of the early members of the National Coalition of Black Gays and of the local DC Coalition. The Sapphire Sapphos used space at the ENIKAlley Coffeehouse in NE Washington. The Coffeehouse was for a time at the center of DC’s African-American gay and lesbian artistic renaissance, one in which Papaya did her part as performer, poet, and putting together skits. She excelled as an MC and often organized. Between 1977 and 1980, she was back and forth between DC and Atlanta where she also organized events. In 1980, Papaya returned to complete her graduate degree in Public Relations Management at American University. With the dawning of the AIDS epidemic, she turned her skills to supporting AIDS education and awareness. She contracted with the Whitman-Walker Clinic to produce the first AIDS outreach publicity campaign and iconic poster for the 1983 AIDS Forum for African-Americans at the Clubhouse. As AIDS gripped the city, Papaya became increasingly involved in AIDS activism and creating support organizations. In 1989 she moved to San Francisco to be with her partner, spending nearly a decade there. In California she used her organizing and AIDS expertise as Executive Director of the AIDS Project of the East Bay. Observing the deteriorating AIDS situation in Washington, Papaya had to come back: “ ... with Washington having the highest prevalent rate of HIV infection in the country that was one of the main reasons why I decided to come back from California when I did. It was like okay, I need to go home. The house is on fire.? Back again in DC, she took charge at DC Cares Consortium, following Chris Bates at that position. Her event organizing continued as well, with a trip to Ghana in 2001 for African-Americans. Papaya continued organizing for the lesbian community as well, joining the steering committee of the Sapphos’ successor, the Black Lesbian Support Group after her return to DC. By 2003 however her growing knowledge of Africa led her to settle in Ghana. 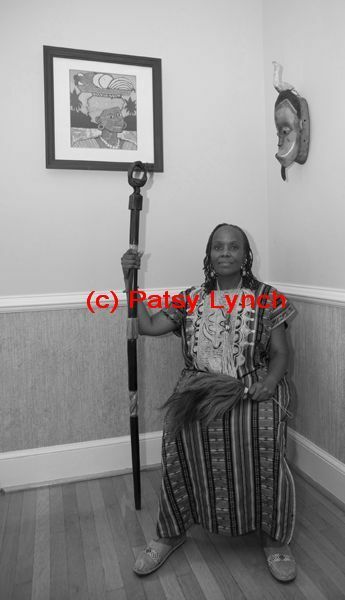 But not content simply to organize support there, she also created the African American Association of Ghana supporting both her host country and the African Americans moving there. For five years she lived largely in Ghana, though keeping in touch here as well. And now she is back here in DC, organizing again and creating nurturing and supportive networks.